Also known as the "living art", the practice of bonsai originated from the Orient. Bonsai has managed to make its way relatively unscathed through the centuries. The practice of bonsai has been popular across nations and empires because of its sheer and evergreen novelty. More than just regular horticulture, growing bonsai is said to be therapeutic and is often regarded as a particularly relaxing form of meditation. The only problem is the lack of definitive information on how to practice the art of growing bonsai. How often should I water my bonsai? How do I get my bonsai tree to take a certain shape? What container should I use? These questions and many more you didn't even know you had are answered by Hikaru Yamasaki in this comprehensive guide. With detailed descriptions and profiles, Yamasaki provides you with expert advice on growing, shaping, potting, cultivation techniques, and more. Everything you need to know about growing bonsai is here. How to properly care for your bonsai tree according to the season and tons more! 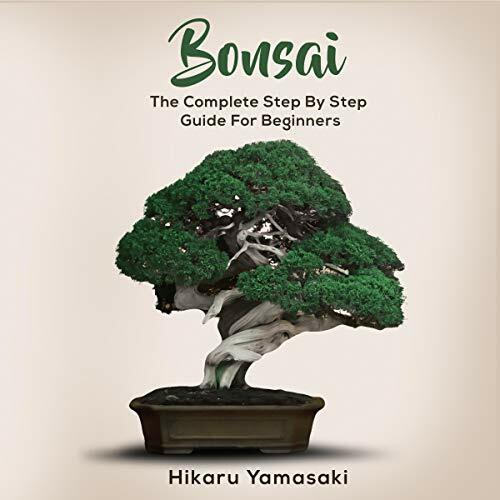 Whether you're an absolute beginner or you already dabble with growing bonsai in your home, Bonsai: The Complete Step by Step Guide for Beginners is jam-packed with information that will help you develop your bonsai growing skill. This audio-book teaches you everything about Bonsai. From the type of styles to how to season your bonsai. 4 hours of in-depth information about Bonsai tree. What else can you ask for? Highly recommend this book. 5 bonsai styles to choose from in this book. This guide is very helpful and explains thorough what each style is. Highly recommend this book for beginners. Teaches you how to get started with a bonsai tree. All the essentials are in this book. Let get this Bonsai rolling! Recommend this book. I didn’t realized bonsai originated from China. Good audio-book that teaches you the foundation of Bonsai. Water and fertilizing a bonsai tree are no joke. My bonsai tree was dying after a month when I started growing a bonsai tree on my own. This book changed my path to becoming a bonsai master. Chose this book because of its nice cover. I’m glad I chose it because it was full of useful information. Hikaru is very knowledgeable. I appreciate the author spending some time to teach us how to grow a bonsai tree in the correct way. the man voicing this had really good inflection in in his voice.....yet really bad timing. still the book is totally worth it if you want to get into bonsai. there are a few parts that can be boring due to the fact you are listening to it, but if you are trying to start bonsai and just want the basics told to you this is the perfect place to start! Awesome book. Guide is very complete and goes step-by-step on how to grow a bonsai. The narrator did a good job in narrating this fabulous book. I would be recommended to all. Good book for beginners. I highly recommend it for newcomers. Good explains about bonsai insight this book. Good book with very informative information. Step by step guideline. Recommend this audio-book to beginners. Book provides thorough information on how to grow a bonsai tree. The history of bonsai and everything about this. Good audio-book. I enjoyed listening to this 4-hour audio-book. Highly recommended this audiobook for everyone. Teaches you how to trim, report and fertilize your bonsai. Everything you need to know about bonsai is in this book. Highly recommend. Appreciate all the helpful information in this book. This is the best bonsai book out there right now. Useful information on Bonsai Tree. Gave it a 5-star review. Best for beginners how can do it. Listen to this audiobook and you will be glad that you listened to it. Very detailed information on bonsai tree.